For those who are excited to learn about other cultures and discover unique architectural structures, the Swayambhu Stupa in Nepal is an excellent place to visit. This Buddhist shrine, often called "the Monkey Temple" by tourists, has several different buildings that all have representative and symbolic meanings. For example, the main Stupa features the eyes of Buddha which are situated to face each cardinal direction, as the Buddha is all-seeing. The main Stupa also has a white dome, which represents creation. Shrines have the most Nepalese people and pilgrims on Saturdays, which is a day off from work. Early morning, particularly before 9 a.m., is a time when the temple looks the most ethereal. The Five Dhyani Buddhas, which are representative of each of the five senses, are also featured it the main stupa. Several shrines symbolize the classic elements as well, including water, earth, and fire. One particular shrine, the Harati Devi Temple, represents the Hindu goddess of illnesses including smallpox. This is an interesting sight as people give offerings including rice and holy water, and food offerings are fought over by monkeys, pigeons and other animals. The Harati Devi Temple is not as ancient as the others parts of the stupa, as the original was destroyed by King Rana Bahadur Shah. His wife had died of smallpox, and he sought to destroy the temple that had failed to protect her from death. The Swayahmbu Stupa is best visited in spring or autumn, when the weather is the most lovely. There are two main festivals, including the Buddha Jayanti (held in April or May) and Losar (held in March). These events are especially beautiful, as monks come to paint the stupa in a saffron lotus pattern. Gunla, a festival which lasts the month of August or September, celebrates the end of the rainy season in Nepal. This is a beautiful place to visit, as it is full of history, native peoples, and animals that wander the stupas. 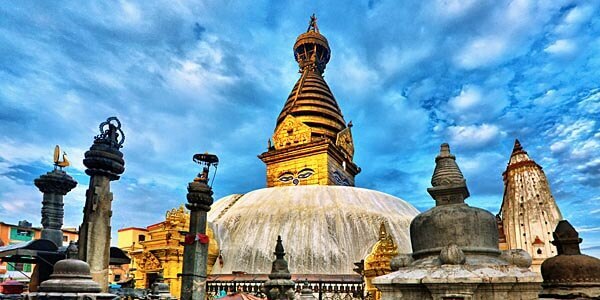 Interesting shrines that are representative of different religious beliefs and historical events make the Swayambhunath Stupa a magnificent place to visit. Last updated by Silvana Taylor on 29 April, 2012 in Destinations.